Geeky: 3/5 – A great story with high production values, a good blend of action, comedy, mystery and romance make this show a hit with geeks of either gender. I took away 1 point for the somewhat slow pacing of the early episodes, and 1 point away for the character designs – they don’t feel as clean or modern as most other contemporary anime characters, even though I understand that’s the style also of the original manga. Sweetie: 4/5 – Chise is a unique female lead. In the begining she is broken inside, however we watch her become stronger and transform due to her magic training and new found feelings and emotions. Story: 10/10 – (Note there may be spoilers in this paragraph up to episode 12). The story is quite interesting, Chise has seen strange monsters and creatures since she was very young. Paralyzed by fear, Chise withdraws from the world around her. Her parents are unsure how to handle her, so her dad runs off and her mother kills herself. Chise is passed off to other family members but they also don’t know how to handle Chise’s unique condition. At one point, Chise discovers someone very similar to herself, able to see the same creatures as well. He grants Chise a special book. In the end, he entrusts Chise with a special request which leads her on her path. Chise wants to escape her world, to the point she tries to kill herself, and doesn’t care what happens to her or anyone else. Sensing Chise’s magical abilities, men approach her and get her to sign a contract, placing her in a strange auction for magical goods. Elias meets Chise at this auction and purchases her to be his apprentice, and future bride. Thus Chise’s magical training begins. Chise is later discovered to be a Sleigh Beggy. A person who can see spirits and fairies. These people usually live short lives because their magic powers are so strong and so draining. Elias is working on a spell that can break the “curse” upon Chise, while also showing her love and affection and giving her a home for the first time. 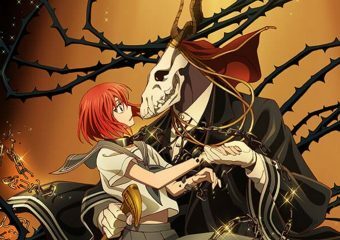 Chise’s heart begins to open and she too begins to show Elias what it is like to be loved for the first time. As part of their “honey moon” they travel around the world helping people with magic quests, which further help Chise develop her skills and talents. WTF happened to Chise’s little sister/brother? Maybe it’s as simple as a miscarriage? Maybe it’s related to why Chise’s mom killed herself? What happened to Chise’s father? Will he ever be back in the picture? Will Chise die from her magical abilities, or will Elias find a way to save her? Will Elias ever become human? Can Chise and Elias’ love survive all of the odds against them? All of these questions keep you intrigued and watching each week. Characters: 8/10 – The characters are interesting and unique. Chise starts out very weak and hard to like, but as the series progresses she matures and finds her own confidence and independence. We also witness the relationship and Elias’ changes as well. All of the minor characters are also awesome. Silky is so funny even though she is silent. And the back story of how Chise gets her familiar, Ruth, is very touching. Ruth is one of my favorite characters in the anime. Artwork: 3/5 – I’m not a fan of the character designs as mentioned above; they just don’t seem very clean and kinda have a retro vibe. The backgrounds and effects on the other hand are lovely. Music: 5/5 – This anime has some of the best music I have ever heard. I love both the opening and ending, but my favorite song is Iruna Etelero, the flower song that Lindel sings in episodes 11 and 12. It’s maybe my favorite song, ever, of all time, from anything, tv, anime, video game, radio, etc. It’s so beautiful and soothing. Voice Acting: 5/5 – The voice acting is also another highlight of this anime. They really make the characters more unique and bring their emotions to life. From the deep booming voice of Elias, to the sweet soft voice of Lindel, or the sarcastic and sadistic voice of one of the series’ first villains, each character is well cast.